Jaw bone eventually shrinks when a tooth is lost or following dental trauma. 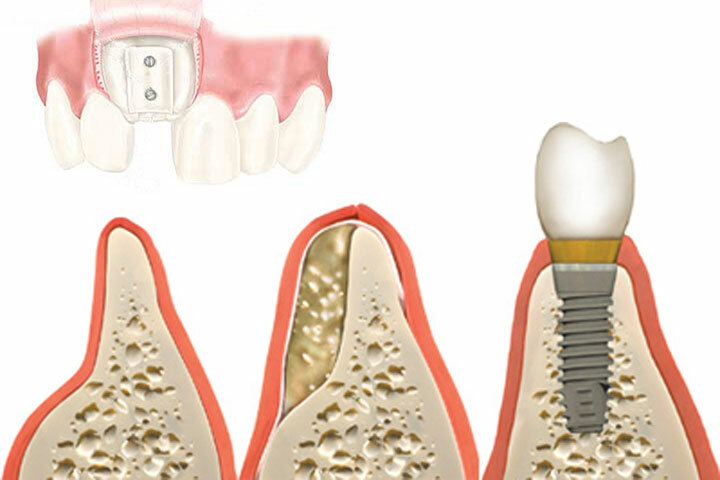 This complicates dental implant therapy and compromises the appearance and function of the final implant and crown. Regeneration procedures, such as guided bone regeneration or block bone grafts, are performed to regenerate bone and to reconstruct the contour of the alveolar ridge. Guided bone regeneration involves placing a bone graft material into bony defects and protecting the site with a barrier membrane to regenerate bone and to reconstruct the contour of the alveolar ridge. A block bone graft takes a small section of bone from the mandible and securing the bone graft to the defect site. Both procedures are performed under local anaesthesia. However, the option to have general anaesthesia is also available.